Taking proper care of your fountain machine may seem like a chore, but it can actually be quite simple. With the help of Bernick’s experts and a routine cleaning schedule at your establishment, your fountain drink machine can not only be a great option for your visitors, but a great experience (and business asset) for you, your staff, and your company. The regular cleaning of your fountain drink machine, its surface, and its components can be done by you and your staff. There are a variety of ways you can ensure your machine is in tip-top condition at all times. Outside Surfaces: When your cleaning staff or employees are tidying up your space, make sure they wipe down the outside of your fountain machine with a clean, damp cloth. This should be done regularly, daily if possible. This will help keep your fountain machine looking sharp. Drain Areas: During your regularly scheduled cleaning throughout the day, make sure to pour hot water down the fountain machine drain. This will keep things fresh and clean and make sure nothing is blocking your drain. Although you can use a mild bleach solution periodically to eliminate any odor, you should never use a drain cleaner. Nozzles: When cleaning your fountain machine nozzles, make sure no chemicals are used. To maintain a tidy soda fountain machine, these should also be cleaned daily. Remove and dismantle the nozzles and soak them in hot water. When we provide initial fountain drink machine setup, we always leave a spare set of nozzles and a cleaning brush with our customers. Use this brush to loosen any syrup that might build up. Bar Gun: Don’t forget this part of the machine! Twist off the nozzle of the bar gun and clean all its components. You can submerge the gun for up to 30 seconds in hot water, and then simply wipe it clean with a cloth. Connectors: Last but not least, clean your connectors. Submerge them in hot water and wipe them clean – it’s that easy. 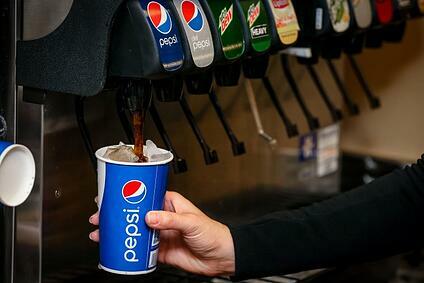 Regular cleaning of your soda fountain machine is a must. By taking the time to properly clean the items noted above, you can ensure your fountain machine is working its best and you can prevent any potential issues. When you partner with us for distribution, preventative fountain machine maintenance is always done by the experts at Bernick’s. Our Service Technicians are scheduled to visit each fountain machine account on a regular basis to perform a variety of preventative maintenance actions and ensure that your fountain machine is meeting your needs. Trouble shooting any issues that arise with your fountain machine can be done by the customer. There are a few different, common issues that can often be corrected without the need of a Bernick’s technician. No Pop or Flat Pop: Check your CO2 levels, and be sure the valve is open. Check the gauges to be sure there is adequate pressure and that there is still CO2 left in the cylinder. No Syrup, Just Water Coming Out: Check to see that there is still syrup in the box. If it is empty, this will need replacement. Proper fountain machine care will keep your machine in peak condition. This means regular cleanings and maintenance. However, if you ever run into a problem that you can't handle, help from a Bernick’s expert is only a phone call away. If you’re unable to determine a fix for your fountain machine or its equipment, that’s OK! Our expert technicians are available 24 hours a day for assistance and maintenance. Our goal is to arrive within 4 hours of your call on weekdays, and we do our best to stick to that. Because of varied needs and issues, service call response can vary during weekends. We work hard to provide our customers with the latest equipment and the best-trained team members to service your machines.